Irena Macri is an internationally acclaimed cookbook author and food blogger who has an insatiable desire to play with food. She draws on her love of world cuisines and all-natural ingredients to produce delicious recipes that promote wellness and longevity. She’s the force behind Eat Drink Paleo, where she shares her mouth-watering paleo and gluten-free recipes; and she also runs Happy Body Formula – a 9-week nutrition and wellness program, and her personal food blog. 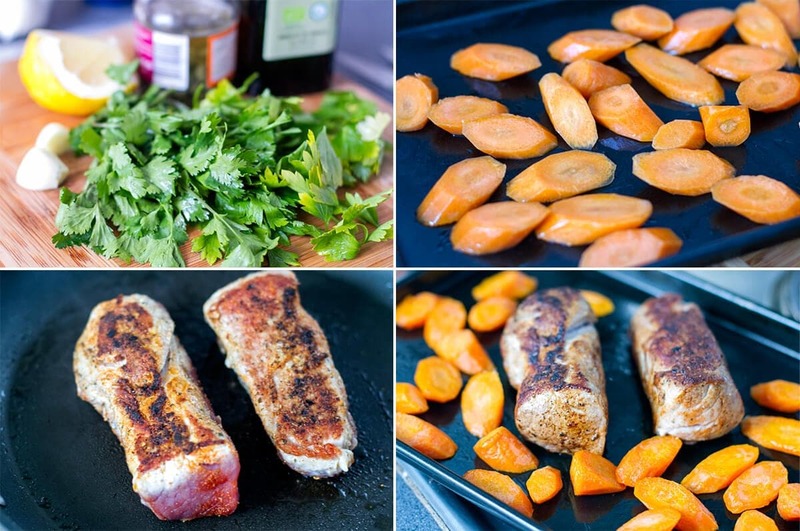 From Irena: Pork tenderloin/fillet is one of my favorite pieces of meat to cook with. It’s a ffordable, lean yet tender and has a delicious flavor. I personally like roasting the whole fillet, which I often use for dinner and lunch left overs, but you can easily slice it in smaller pieces and pan-fry it or grill it. If you can’t find pork tenderloin or fillet, feel free to use pork cutlets or steaks and simply season them with the spice rub before pan-frying or throwing them on the barbecue grill. 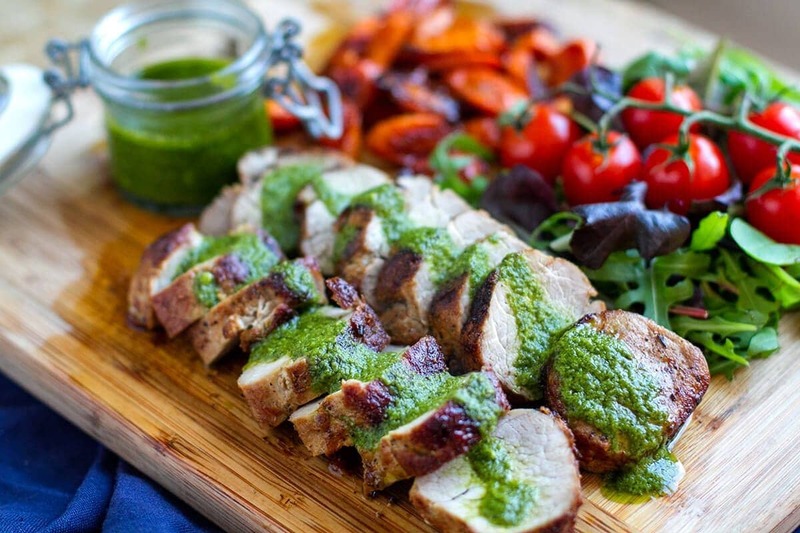 Chicken or red meat go just as well with this spice rub and the salsa verde. My salsa verde has both cilantro and parsley, but feel free to use other fresh herbs on hand such as oregano or basil. It’s such a lovely condiment and will last for 2-3 weeks in the refrigerator. It goes with anything savoury! Cut the pork loin into two halves. Place the pork on a cutting board and cover evenly with the spice rub. Use your fingers to press it in on all sides. Set aside. Coat the carrots in olive oil and scatter on a flat oven tray. Place in the oven, middle tray, for 12 minutes. (back, front and two sides) – a total of 12 minutes. While the pork and carrots are cooking, prepare the salsa verde. Remove the pork from the oven and transfer to a cutting board. Cover loosely with foil and rest for 5 minutes. Push the carrots close together on the tray. Sprinkle evenly with salt and drizzle with the balsamic. Place back in the oven for 2-3 minutes to caramelize slightly. 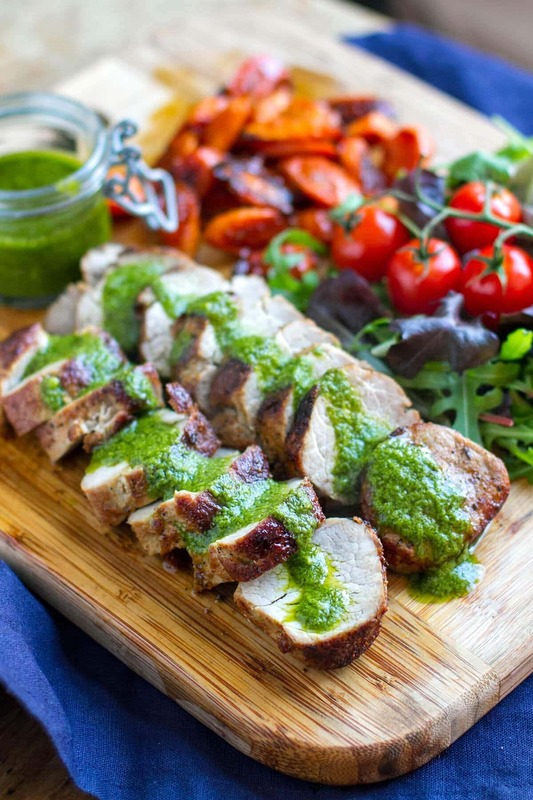 Slice the pork and drizzle with a few tablespoons of salsa verde. Serve with a side salad, roasted carrots and extra salsa. Salsa verde will keep for 2-3 weeks in an airtight, clean jar. You can use as a marinade for chicken or shrimp, in salad dressings, as a condiment with meat and fish, or drizzled over scrambled eggs. The pork was great, but the salsa verde was lacking in flavour and consistency. After following the recipe to a T, I would recommend making the pork as is, but finding another salsa verde recipe.